Recipe submitted by Laurence R. Smith, II, Director of Marketing, HPV Franchise, Merck & Co., Inc.
Italians close their businesses for several hours each afternoon to enjoy a long, leisurely lunch, and then work late into the night. In the States, we take about 30 minutes for our lunch. 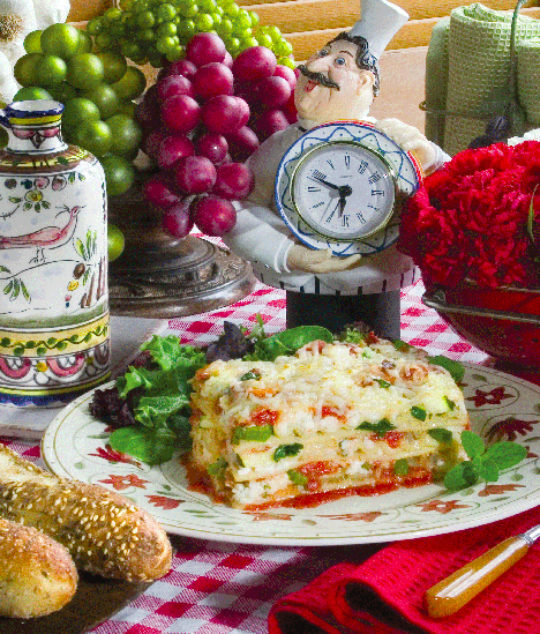 Enjoy the best of both worlds: make this lasagna a day ahead and pack a serving to microwave for lunch. In a large pot of boiling, salted water, cook noodles until slightly chewy, about 8 minutes. Drain and carefully drape noodles over side of colander. While pasta boils, sauté carrots, onion, celery and bell pepper in skillet with olive oil. Sprinkle with salt and pepper, stirring frequently. When veggies are fork tender, add zucchini, spinach and mushrooms. Sauté until spinach wilts and all veggies are tender. In a small bowl, combine ricotta, egg, 1/4 cup Parmesan, basil and parsley. Spoon about 1/2 cup sauce into bottom of casserole dish. Reserve 1/4 cup mozzarella. Arrange four noodles overlapping in casserole dish, top with about 1/3 the vegetable mixture, 1/3 the ricotta mixture, 1 cup sauce, 1/4 cup mozzarella and 1 tablespoon Parmesan. Repeat, layering two more times, ending with sauce. Sprinkle top with remaining mozzarella, and bake 35–40 minutes until top is crusty.